2016 Hyundai Ioniq - everything you need to know | What Car? 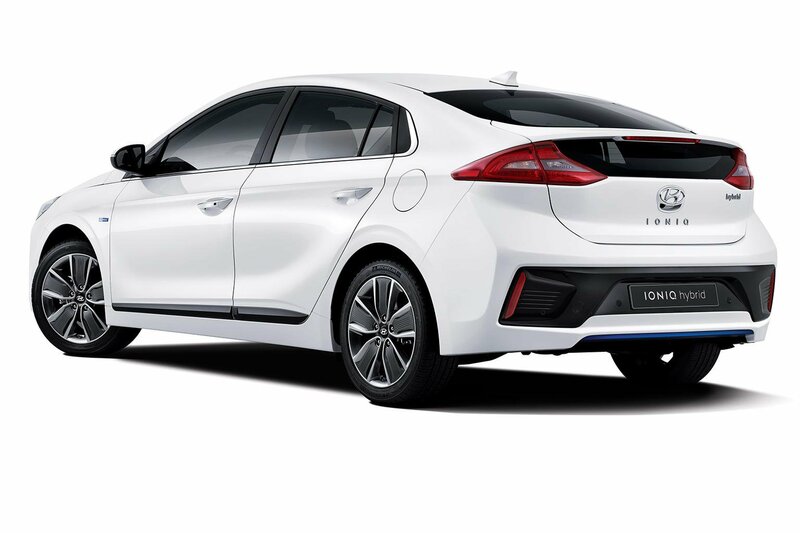 The Hyundai Ioniq is a new electric model that will go on sale in the UK in October, with prices starting from £19,995. The Ioniq is being billed as the first car to be available with three different powertrains: hybrid, plug-in hybrid and full electric. 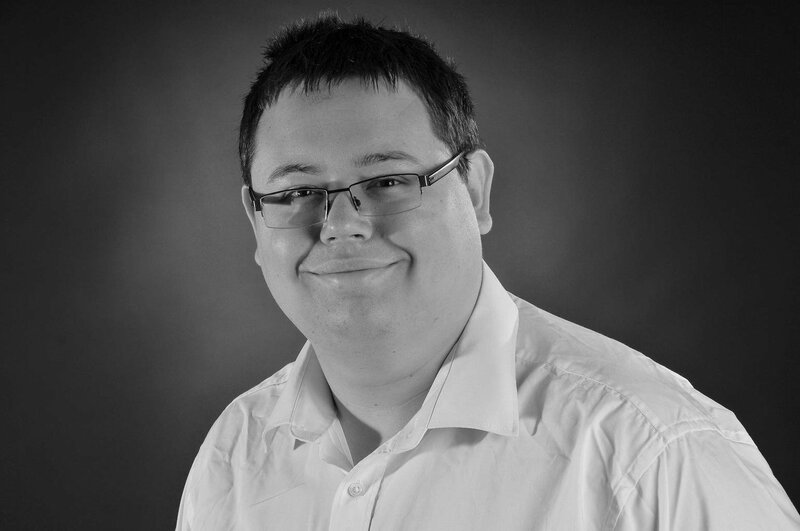 It is Hyundai's rival for the latest Toyota Prius, Renault Zoe, Nissan Leaf and BMW i3. The majority of UK Ioniq buyers customers are likely to opt for the plug-in hybrid version, with the regular hybrid accounting for around 35% of sales, and the full EV taking just 15% of sales. As a regular hybrid, the Ioniq is powered by a 1.6-litre petrol engine working in conjunction with an electric motor, fed by a lithium-ion battery pack. Combined power output is placed at 146bhp, and in this form both the petrol engine and electric motor provide forward motion. As a plug-in hybrid, the Ioniq's petrol engine is used to charge the battery when power reserves run low, and the electric motor generates more power. In this form, the Ioniq is capable of travelling up to 31 miles on electric power alone, and emits 32g/km of CO2. In pure electric form, the Ioniq is claimed to be capable of travelling 155 miles on a single charge, again thanks to a more powerful electric motor, and it has a top speed of 103mph. The Ioniq is front-wheel drive, and is connected to either a dual-clutch automatic gearbox, or a single-speed automatic gearbox depending on specification. In comparison, the latest Toyota Prius uses a 1.8-litre petrol engine, working with an electric motor. In hybrid form, it's capable of reaching 62mph in 10.6sec, and has a top speeed of 112mph. 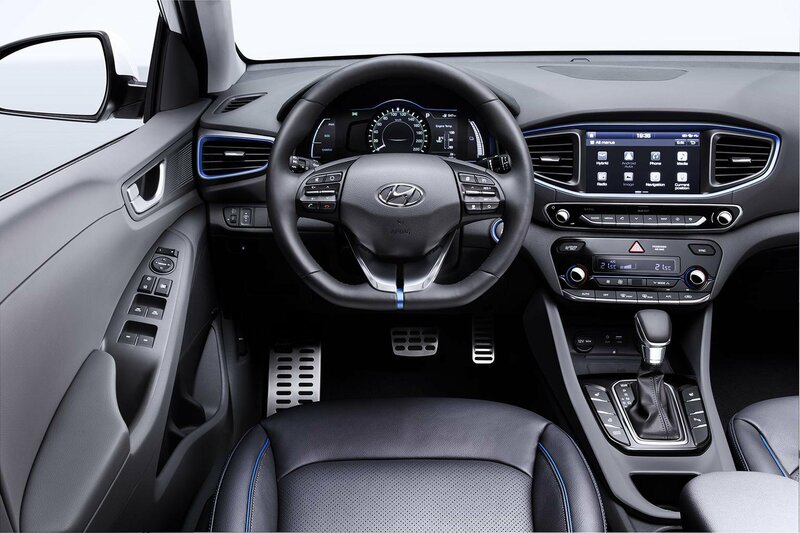 The Ioniq's interior is said to feature eco-friendly materials and a relatively clutter-free approach. There's a central infotainment screen included, which drivers can use to access functions like satellite navigation. A wireless charging mat for mobile phones is also included, and drivers can control their smartphones from the screen by using the Apple CarPlay and Android Auto apps. In entry-level form, the Ioniq comes with 15in alloy wheels, DAB radio with Bluetooth connectivity, cruise control and rear parking sensors with a rear parking camera. More luxurious models get heated and cooled seats and larger alloy wheels. In terms of safety technology, the Ioniq features autonomous emergency braking, lane keeping assistance, blind spot detection, a rear traffic alert and adaptive cruise control. Prices will start from £19,995 for the hybrid model, which means this Ioniq will be cheaper than a comparable Toyota Prius, which starts at £23,295. The pure electric Ioniq, meanwhile, is priced from £28,995, while prices for the plug-in hybrid version of the Ioniq won't be announced until next year, when it will appear in dealerships. By comparison, the plug-in hybrid Toyota Prius is priced from £28,395, while fully electric vehicles like the Renault Zoe and Nissan Leaf hatchbacks start at £13,945 and £19,490 respectively. 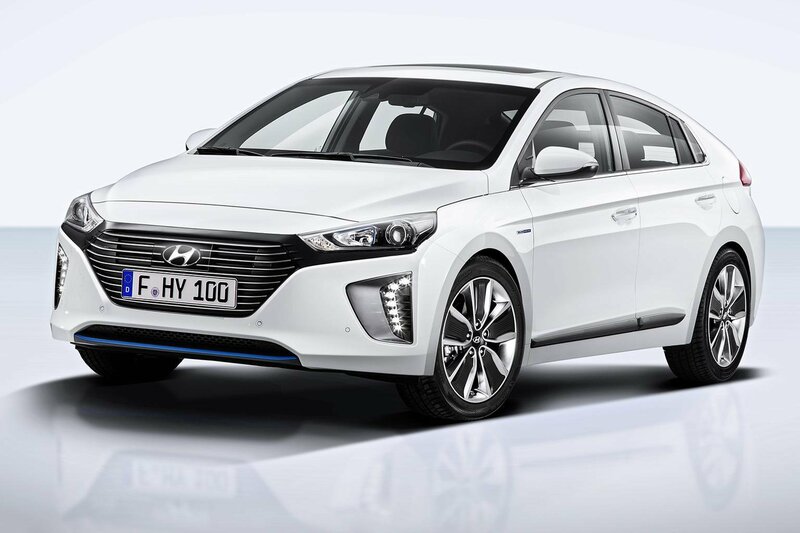 The Hyundai Ioniq will be going up against a growing selection of hybrid and electric vehicles, including our current Electric Car of the Year, the Volkswagen Passat GTE Estate. Our sister title, Autocar, has already driven the Ioniq in hybrid form, and you can read that full review here.